The MoD is considering development of a VTOL aircraft for the current and future aircraft carriers. The Russian Defense Ministry is considering the development of a vertical takeoff (VTOL) plane for aircraft carriers based on the Yak-family, Deputy Defense Minister Yury Borisov said. The VTOL aircraft would be based on the Yak-family jets. "The Defense Ministry is discussing with our aircraft manufacturers the development of an aircraft with a short take-off and landing, possibly with a vertical take-off and landing, this is the development of the Yak line", Borisov said on the sidelines of the MAKS-2017 air show. Currently, Russia has only one aicraft-carrying cruiser, the Admiral Kuznetsov. Late last month, Vice-Adm. Viktor Bursuk, Russia's deputy navy commander in charge of procurement, said that the Russian Navy is planning the construction of a new aircraft carrier to accompany the Admiral Kuznetsov. The news appeared on MAKS' FB Page. Russia had already made an aircraft with a take-off system very similar to that of the modern F-35. In the 80s, the Russian Yakolev aerospace industry had developed a supersonic vertical takeoff/landing (VTOL) fighter aircraft called Yak-141 or Yak-41. The Yak-141 performed the first conventional flight at Zhukovsky airport in 1987 and the first hovering flight two years later. The aicraft had made the first complete transition from vertical to high-speed flight and vertical landing in 1990, subsequently various kinds of rolling take-off and run-on landings were performed on normal runways and also on "ski-jump" ramps. 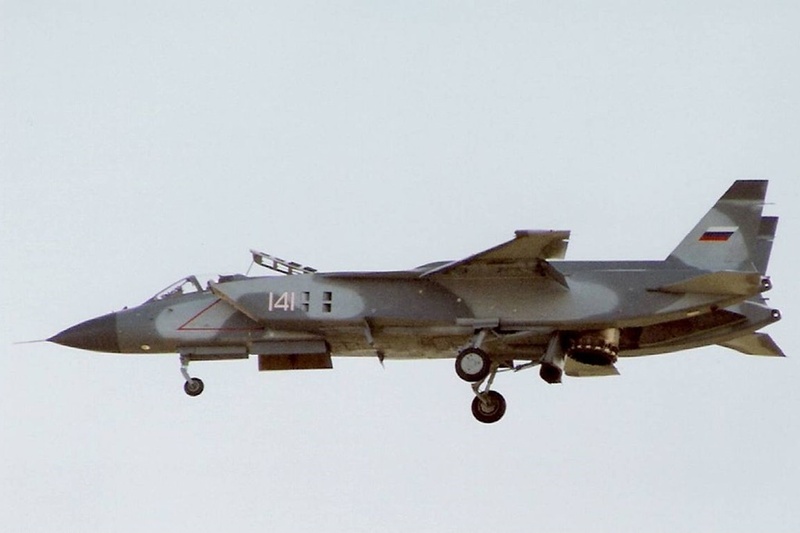 The Yak-141 made the first vertical landing on the flight deck of russian aircraft carrier Admiral Gorshkov in 1991. During the same year the pilots made eight successfully test flights from the ship until a undercarriage ruptured a fuel tank causing a serious fire. After the accident the Soviet Navy announced that no further funds were available to continue the program.